72 x 108 x 4 1/2 in. 30 x 31 x 4 1/2 in. 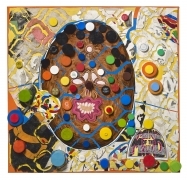 TRENTON DOYLE HANCOCK, When They Found Me I Wasn't There, Version #2, Acrylic and mixed media on canvas, 72 x 72 in. James Cohan is pleased to present Pandemic Pentameter, Trenton Doyle Hancock’s sixth solo exhibition with the gallery. 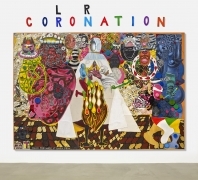 The exhibition, presenting a group of large scale paintings produced this year, opens Friday, October 21 with a reception from 6-8 PM, and will be on view through November 26 at the gallery’s Lower East Side location. Comprising a new series of paintings, this exhibition by the Houston based artist further expands his interest in storytelling. Hancock has long been admired for his ability to meld a deep and personal interest in narrative with a particularly rigorous and physical approach to painting. His intricately detailed compositions are loaded with imagery from a collection of sources, including comic books, action figures, motifs from childhood, and grand manner history painting, creating an ever-expanding lexicon to tell the tales of the Moundverse and its cast of characters. 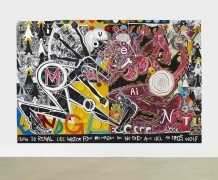 In these new paintings, Hancock engages the full breadth of his aesthetic arsenal, unfolding his mythology with a pantheon of new quasi-deities and villains alongside Torpedoboy, Hancock’s superhero doppelgänger. The title of the show, Pandemic Pentameter, reveals the centrality of language and wordplay in Hancock’s practice. 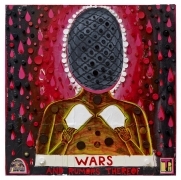 In The She Wolf Amongst Them Fed Undom’s Conundrum (2016), Hancock includes the absurd, lengthy palindrome, “Flow so renal like water font on madam not no fret awe kill an eros wolf.” Although lacking clear semantic meaning, the urgency of the phrase matches the flurried fisticuffs of the figures in the painting and enhances the work’s own reality. 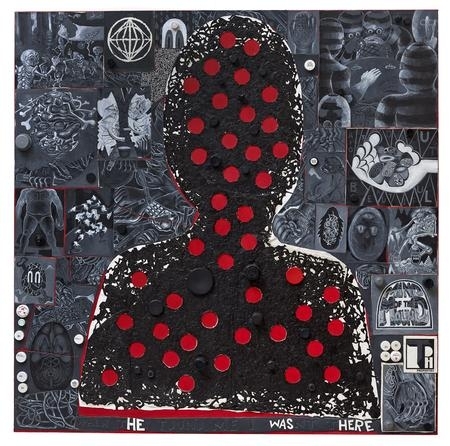 Hancock’s playful kneading of words and syntax is mirrored in the accumulation of visual references in his works, as with the intricate assemblage of images in When They Found Me I Wasn’t There, Version #2 (2016), that come together to form a unified picture despite its fragmented composition. 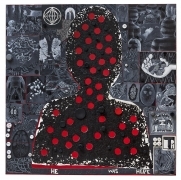 The complexity of Hancock’s narratives is echoed by the increasingly layered nature of his collaged paintings. Sculptural elements and daubs of heavy impasto emerge from the canvases, piercing the boundary between two and three dimensions. The flattened, frieze-like perspective of these works creates dizzying scenes of simultaneous action, and his strong vertical lines and recessed figures create a spatial understanding that invite the viewer into the picture plane. 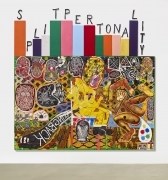 Although the inclusion of ready-made objects and mixed media elements intentionally diminishes the indexical evidence of the artist’s hand, Hancock’s past as a cartoonist and passion for storytelling is still evident in this new body of work. 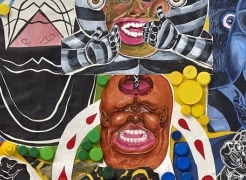 Through this synthesis of innovative methods, coupled with the layering of word and image, Hancock is able to bridge the divide between his own mythos and our reality. Trenton Doyle Hancock was born in 1974 in Oklahoma City, OK. Raised in Paris, Texas, Hancock earned his BFA from Texas A&M University, Commerce and his MFA from the Tyler School of Art at Temple University, Philadelphia. Hancock was featured in the 2000 and 2002 Whitney Biennial exhibitions and his work has been the subject of one-person exhibitions at The Contemporary Arts Museum, Houston; The Modern Art Museum of Fort Worth; The Museum of Contemporary Art, North Miami; Institute for Contemporary Art at the University of Pennsylvania, Philadelphia; The Studio Museum in Harlem, New York; The University of South Florida Contemporary Art Museum, Tampa; The Savannah College of Art and Design, Savannah; The Weatherspoon Museum, Greensboro; Olympic Sculpture Park at the Seattle Art Museum, WA; The Fruitmarket Gallery, Edinburgh; and Museum Boijmans Van Beuningen, Rotterdam, The Netherlands. Hancock’s work is in the permanent collections of several prestigious museums, including the Museum of Modern Art, New York; The Whitney Museum of American Art, New York; Brooklyn Museum; The Studio Museum in Harlem, New York; Baltimore Museum of Art; Columbus Museum of Art; The Contemporary Museum, Honolulu; The Cooper-Hewitt National Design Museum, New York; Dallas Museum of Art; High Museum of Art, Atlanta; Peekskill; Museum of Fine Arts, Houston; Kemper Modern Art Museum of Fort Worth; Museum of Contemporary Art, Kansas City; Museo di arte moderna e contemporanea, Trento, Italy; Museum Boijmans Van Beuningen, Rotterdam, The Netherlands; Museum of Art, San Francisco Museum of Modern Art; Virginia Museum of Fine Arts, VA; Warhol Museum; Wexner Center for the Arts, Ohio State University. The recipient of numerous awards, Trenton Doyle Hancock lives and works in Houston, TX. For other inquiries, please contact David Norr at dnorr@jamescohan.com or 212.714.9500. "Trenton Doyle Hancock at James Cohan, New York"